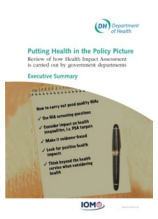 This evaluation, which I led, is the first of its kind internationally to systematically consider how Health Impact Assessment is being used within Impact Assessment, and whether it can affect policy making. It developed an innovative approach to evaluate policy impact assessments. While systematic HIA is seldom done as part of the IA process, some basic level of considering the possible health impacts is relatively widespread. When health impacts are considered there is a tendency to: focus on negative health impacts at the expense of positive health impacts; focus on a small number of the determinants of health; not consider health inequalities; and not use public health evidence to back up statements. Twelve recommendations were made to improve the consideration of health in policy-making.